European service workers are generally paid decent wages, so tipping is not as necessary in European countries than in the United States, where tipping has somewhat become an unspoken requirement. In certain European countries, tipping is even considered excessive. However, you are still free to tip whenever you feel extremely satisfied with a service. The show of gratitude is still very much appreciated. The amount to tip and the specific service sectors for which tipping is common may vary by country, but the general patterns, as stated below, are not difficult to follow. 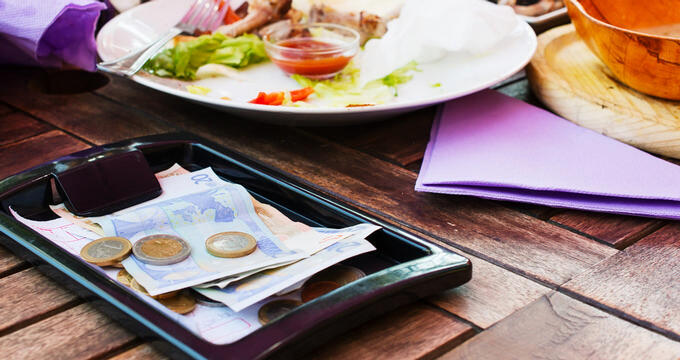 Some restaurants and other dining establishments already include a service charge in your bill, so you may want to consider that before tipping. Cafes - Any eating place without table service is generally not tipped anymore. However, there are some places that have tipping jars or anything similar on their counters. People will just generally put any loose change they have in these jars. But again, giving is not required. Restaurant waitstaff - Diners often tip when extremely satisfied with the work of their restaurant waiter or waitress. 10% of the total bill is a generous amount already. Anything above that is too much and will definitely get you weird looks. Another common practice for tipping waiters and waitresses is to round up your bill and let them keep the change. In some countries, you must be discreet when giving tips. In Germany, for example, give the total amount you want to give (bill plus tip). It is already understood that the difference is a tip for your waiter. In London, some restaurants list an optional tip on your bill. But it is still not expected. You may tip only if the service is good enough. Bartenders - Europeans do not commonly tip bartenders, but tourists can give 1 or 2 pounds for good service. You can do the same if you bartender is friendly, fast, or makes good conversation. Shuttle drivers - Drivers of airport shuttles in Europe do not expect to be tipped, but do hand 1 pound for each bag they help you with, if any. Cab drivers - To tip good taxi drivers (those who are courteous and drive well), round up your fare and let them keep the change. Round up to the closest 5 and 10 pounds for short and long trips, respectively. You may want to give more if the driver has been particularly friendly or helpful. Tipping extra is a must if the driver gets you to your destination promptly despite you waking up late and/or helps you with your very heavy luggage. Bellhops - The common amount given to bellhops in Europe is 1 to 2 pounds per bag. Feel free to add a certain amount, but anything going over a total tip amount of 5 pounds will be considered too much. Housekeeping staff - Hotel guests typically leave just a small tip of about 2 pounds for their stay to show thanks for great housekeeping. Concierges - Concierges are not typically tipped in Europe, just like in many other places, but a tip of 1 or 2 pounds is not uncommon for exceptional service. Doormen - Hotel doormen in many European countries are typically not tipped anymore, but they often get an additional 1 or 2 pounds from extremely satisfied guests. Spa attendants - In some places, guests tip spa service providers up to 10% to show appreciation for good service. Hairstylists - If you are particularly happy with the hairstylist’s work, you can give a tip of up to 10% of your total bill. Give cash because the money may not go to your server if you tip via credit card. Tip in the local currency because having to convert tips in foreign currencies will mean additional work for your server and bank charges. Be careful not to give too much. You may think you are being generous, but you will just look culturally ignorant. You may even unknowingly offend or insult your server or the establishment. Again, service workers in Europe are already paid decently. In some tourist-heavy places, service workers have become used to receiving excessive tips from tourists, particularly Americans. Nonetheless, there is no pressure at all, so you do not need to worry about giving too little or too much. Regarding the service charge, it is not always specified in the bill. In Mediterranean countries, for example, restaurants may or may not include the service charge. In eastern and northern European countries, menus and bills often do not make any mention of the service charge, but it can be safely assumed to be included.